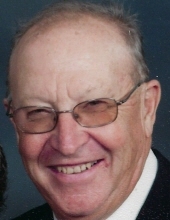 James F. "Jim" Wolff, age 79, a resident of Naperville, IL since 1965, formerly of West Chicago, IL, passed away on Wednesday, March 27, 2019 at his home surrounded by his loving family. He was born November 7, 1939 in Aurora, IL. Beloved husband of Mary Ann Wolff (nee Steffgen), whom he married May 15, 1965, loving father of Jim (Tina) Wolff, Christine (Lee) Leonard, Jeanne (Mark) Supena and Cathy (Brian) Victorine, adored grandfather of Adam and Ryan Wolff; Lee, Rick and Jessica Leonard; Jordan and Madison Supena: Alexandria and Anthony Victorine, cherished great-grandfather of Rohan Leonard, devoted son of the late George and Mary Ellen (nee Ormond) Wolff, dear brother of George (Louise) Wolff, John (Shirley) Wolff, Marie (Mike Frohman) Wolff and the late Tom (the late Mary Lee) Wolff, fond cousin, brother-in-law, uncle, great-uncle and friend of many. Jim grew up in West Chicago, attended St. Mary Grade School and was a 1958 graduate of Marmion Military Academy in Aurora. Jim proudly served in the U.S. Army from 1962-1965. A third generation carpenter, Jim began his career working with his father' s business, George Wolff Builder and started his own company, James Wolff Builder in 1985. Jim was a former member of SS. Peter & Paul Catholic Church and a current member of St. Thomas the Apostle Catholic Church, both in Naperville. Jim loved to work with his hands, meet and talk to people and most of all, spend time with his grandchildren. Visitation Monday, April 1, 2019, 4:00-8:00 PM at Friedrich-Jones Funeral Home & Cremation Services, 44 S. Mill St., Naperville, IL. A Mass of Christian Burial will be celebrated Tuesday, April 2, 10:30 AM at St. Thomas the Apostle Catholic Church, 1500 Brookdale Rd., Naperville. Family and friends will meet Tuesday, 2:00 PM in the chapel at Assumption Cemetery, Wheaton, IL for committal services. To send flowers or a remembrance gift to the family of James F. "Jim" Wolff, please visit our Tribute Store. "Email Address" would like to share the life celebration of James F. "Jim" Wolff. Click on the "link" to go to share a favorite memory or leave a condolence message for the family.